When designing the Luck Has Nothing to Do With It sweater for S Twist Wool, I was asked to knit the sample in a specific size. Which was of course totally fine. Except that the size had to fit a size 40" chest with some ease (which I interpreted as the sweater itself being 44") and my husband - who is also my inhouse male model - measures 44.5". And so the search for a suitable model began. Of course, the men around these parts don't tend to know their chest measurements offhand. So I arranged for several of my friends who I thought might be close to the sample size to model for me, hoping for the best. And then, an interesting thing happened. The sweater fit them all! Despite the fact that their actual chest measurements ranged from 38" to 43". So here is Mr. O, who is a 43". You can see there is a tad of pulling around the widest part of his chest, but it does fit, and looks rather nice I think. Meanwhile, in the aerial shot earlier Mr. K measures 40" and with 4" of ease the sweater looks fine as well. The fit is a bit roomier still on Mr C., who is 38" around the chest. And then here it is on me - a mere 34". Too long, yes. But not overly loose looking, I don't think? Even my husband, at 44.5", can fit into this sweater. And the only part of it that looks blatantly too small for his frame, is the yoke depth. Width-wise, the negative ease actually looks kind of good. By far not everything I've knit has been this versatile in fit. And I suspect the cause of this versatility is in large part the yarn. When worked in stockinette, the aran weight S Twist Wool feels unusually stretchy, to the point that if I were told it has substantial nylon content (it doesn't), I would believe it. What exactly determines whether a yarn has this quality, I don't know - but I am certainly inspired to find out. In the meanwhile, the sample sweater is leaving me for a little tour of festivals and yarn shops. And I will probably knit another, this time for my husband, in a size with a tad more positive ease for his frame. Since my return to knitting as an adult, I have made a few cardigans - maybe a half dozen? - all of them knitted seamlessly, but 'open' - in the flat on a long circular needle. To be perfectly honest, I had no complaints about this method. While I do prefer to knit pullovers and dresses in the round, this is mainly because I dislike assembly and prefer for my garments not to have seams - not because I dislike knitting back and forth, if that makes sense. I also do not have the aversion to purling the way some knitters do, so purling every alternative row when knitting stockinette in the flat is not a problem for me. Considering all of that, in hindsight, steeking for me was a solution in search of a problem! But sometimes, you know - you see a technique and it just looks so cool that you want to explore it. In case some of you reading this have not heard of it before, steeking is a cardigan construction technique, Scandinavian and/or Scottish in origin. Instead of knitting a cardigan open, you knit it in the round, as if it were a pullover. You then cut it along the centre front vertically, and pick up stitches for the button band along the newly created edges. It's a method that makes the most sense when you are knitting a sweater with stranded colourwork - which is easier to execute in the round than in the flat. Some lace and cable patterns can similarly benefit. 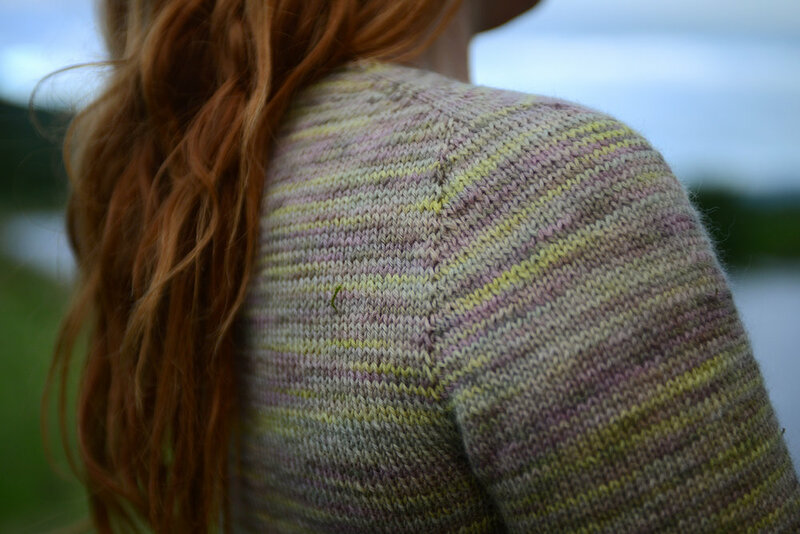 However, it seems that a good portion of knitters simply prefer steeking as their go-to method of cardigan construction even if there isn't any colourwork, lace, or cables to contend with - the reasoning being that it is faster/easier/pleasanter to knit in the round, and afterward steek, a cardigan, than to knit it open. After reading lots of this type of feedback, it occurred to me that I too might be such a knitter. And so I decided to steek - starting with a simple cardigan design I was working on, with a circular Old Shale lace yoke. It's a stitch pattern that can be knitted in the flat without issue, but admittedly it was easier in the round. There are several approaches to steeking out there. After studying all the ones I could find I decided to go with the one described by Kate Davis and Ysolda Teague, which involves re-inforicng the steeked edges with slip stitch crochet before cutting. After reading about this method and looking at the diagrams, it all made complete sense to me. And so unlike many, who report being terrified to try steeking, I approached it pretty calmly and casually. I knitted the sweater top down, with 5 steek stitches in the centre (interrupting the lace pattern in the yoke and hem). For the crochet reinforcement I used sock yarn in a complimentary, but distinguishable colour to the sweater yarn, then slipped stitched in straight columns according to the diagram in the Ysolda post linked above. Doing this part was fun, although it did take forever as my cardigan is on the long side - maybe a half hour for each edge? Then, once the crochet reinforcements were in place, I took a pair of embroidery scissors and snipped right through the middle steek stitch - in between the crochet columns. At this stage, everything looked fine and I was well pleased with the result. So I proceeded to fold the left steeked edge back and picked up stitches for the button band. Here again, all was going smoothly. And it was only when I had knitted a few rows of the button band that I noticed bits of frayed yarn were starting to pop out of the crochet reinforcements - which was definitely not supposed to happen, as far as I understood! You will forgive me, but I did not snap pictures at this point - I was too busy panicking and trying not to throw up/ faint. After dropping my knitting and pacing the room for a few minutes, I was finally able to get my hands to stop shaking and think clearly. I do not know why stitches were coming out of the crochet chain. But they were. And it was obvious that I needed to immediately re-reinforce the steeks to stop them unraveling - which I did, with a darning needle and the same sock yarn I used for the crochet reinforcements, using blanket stitch. The result isn't exactly pretty. But at least the edges are secured now to my satisfaction, and they have not frayed any further even after I hand-washed the sweater and laid it out to block. After the cardigan dries, I will cover these 'scars' with grossgrain ribbon and hopefully the end result will look presentable. Unfortunately, even if things look gorgeously tidy, I am not happy with the bulk that has been added here. There are now very tangible seams along the button bands and this is at odds with the rest of the garment being perfectly seamless. In summary: My first attempt at steeking did not go as well as I had hoped. I did manage to rescue the garment, but in retrospect I wish I had just knitted it open. While I agree that steeking is the logical choice when working with stranded colourwork and certain cable and lace motifs, there was no need for me to knit this particular cardigan in the round other than as an experiment. And well I guess this serves as a reminder that not all experiments have favorable outcomes! All that being said, I do plan to steek again in future, if the nature of the garment calls for it. I will do more research next time to try and understand what went wrong for me here, and hopefully will have a smoother experience. Likewise, I do not mean to discourage others from giving steeking a try. By all means, give it a go - just be aware that things may not work out perfectly, and perhaps have a backup plan if you experience fraying the way I did. Learning after all, is about trial and error, and it is often these types of incidents that end up being valuable - or at least memorable! - learning experiences. A couple of days ago I was working on a sweater, sitting in a lovely lush grassy spot on top of a hill some miles from my house. And just as I got to the exciting part of separating the sleeves (it's a top-down sweater in the round), I managed to drop my tapestry needle. The needle was one of those aluminium ones, anodized a nice shade of green. So you probably see where this is going. Green needle, green grass… After a frustrated search I finally came to terms with the fact I would likely never see it again! Which is a shame, but at least I was still able to move the sleeve stitches onto scrap yarn, using my knitting needles. And in case this is not a method familiar to everyone, I thought it might be useful to share it. Start by arranging the scrap yarn in your hand as if you are going to knit with it, with the short end of the scrap yarn being where where the working yarn would normally flow from. Then Ktog as many stitches you can comfortably manage (the picture shows k3tog, but you can do K2tog, K5tog, whatever). Now, with your working needle, pull at the the knitted stitch you have just created until the short end of the scrap yarn pops out. And - voilà! The stitches are now threaded onto the scrap yarn. Obviously, the more stitches you can Ktog at a time, the faster this will go. Just be careful not to take on so many as to drop stitches or make the process so awkward that it is actually slower than doing fewer at a time. While not quite as efficient as simply threading the stitches onto scrap yarn, if you find yourself without a tapestry needle it's better than having to put your work aside just as you are getting to the exciting part! I have mentioned earlier that I've embarked on a series of collaborations with Jennifer Leinhard of Woolfinch Studio. Basically, I am designing some patterns using Woolfinch Studio yarns, and it is a tremendously satisfying project. One of the things I find uncanny about working with Jennifer, is that we have a similar design aesthetic - to the point that a few times we have emailed each other sketches simultaneously, and the sketches looked nearly identical. When designing a pattern for her merino Pastel Twist yarn, we both had the idea for a scoop neck top with 3/4 sleeves. Mine included ruffles and a flared hem. Hers was a more basic cropped top. But at the core, it seemed to me, they were really the same garment. Inspired perhaps by my recent dealigns with sewing patterns, I then decided to design two versions of the same top. The result is 'Ada and Ardor.' Whether the literary reference makes you smile or cringe, the names feel apt to me. The Woolfinch Studio Pastel Twist is a soft, ethereal-looking yarn that has a sense of wistfulness and nostalgia about it. It makes me think of 'Old Europe.' Long summer nights. Walks through abandoned, overgrown gardens... It's a yarn that shows restraint, but also a hidden splendor. Ada is an elegantly modest cropped scoopneck pullover with 3/4 sleeves and subtle shaping through the bodice. Ardor is an exuberant cardigan with a deep ruffled neckline, dramatic waist shaping, and flared hem. The designs are essentially each other's alter egos. Whether I can communicate all this in the finished pieces remains to be seen. But at any rate, I now have Ada mostly done, and the result looks pleasingly as-intended. After it's blocked and properly photographed, I will undo the neckband, cuffs and hem, and re-knit them, transforming the sweater into Ardor. As steeking will be involved to turn the pullover into a cardigan, the process will be irreversible and Ardor she shall remain from that point on... which I think is all right with me. I am not yet sure whether Ada and Ardor will be written as two separate patterns, or as one pattern with two options. But most likely the latter - allowing the knitter to make their way through a good chunk of the garment before deciding which version feels right. With Ada now laying out flat to dry, I look forward to completing this project and sharing the final result. It was recently pointed out to me that I knit my (top down) sweaters in what is apparently not the usual sequence! The usual one, I suppose, being: yoke, bodice, sleeves, collar? In that case, true enough. I knit the yoke. Then the sleeves, one at a time. Then, if the design calls for picking up the collar, I knit the collar. And only then do I finish the bodice and hem. To be honest, I don't really think there is a correct vs an incorrect sequence to knitting a sweater, as long as you get all of it done in the end! Nevertheless, if my way of doing it seems weird I can explain the reason behind the madness: I am usually designing/improvising the sweater as I am knitting it. And when design-knitting the bodice, decisions about shaping and length need to be made. To make those decisions the sweater needs to hang properly off the shoulders - which it can't do without the sleeves present. Before the sleeves are attached, the empty armholes curl and the yoke puckers up a bit, changing the fit of the garment compared to how it will be when the weight of the sleeves pulls at both sides, if that makes sense. So that's why I need the sleeves, you see, to get the rest of it just right. Also? With the rest of the sweater done, I know exactly how much yarn I have left as I approach the hem, and whether I have the option of turning the sweater into a tunic or dress at the end. Of course, if you are working from a pattern and your knitting does not involve this type of decision-making, it might be handier to knit the whole thing top-down, and then add the sleeves. Although who is to say? One knitter I know prefers to do both sleeves in tandem with the bodice - work a few inches on the bodice, then a few inches on sleeve 1, then on sleeve 2, and so on round and round. Otherwise she gets bored with the monotony of doing an entire sleeve, or bodice, in one go. In the end, it's to each their own. If we knit long enough, we all develop our own little methods that, whether or not they appear logical to others, make sense to us! That being said: What's your sweater sequence?